This monster appears to be the child of Gishki Avance and Gishki Emilia; this monster's hair is a layered combination of the white and red hair of Avance and Emilia, respectively. He also has one blue eye (like Avance) and one red eye (like Emilia). This makes sense, as Avance and Emilia were last seen in the conclusion of the Duel Terminal storyline (seen in Sacred Serpent's Wake), looking off into the distance together as the last survivors of the war. The duo are also featured on several other Nekroz cards, implying that the archetype represents the pair's new family after some time has passed. Similar to how the hilt of his father's sword resembles a Gishki Aquamirror, the hilt of this monster's sword appears to be a Nekroz Mirror. Nekroz of Brionac and Nekroz of Trishula appear to be older versions of this monster. Their swords have similar designs and both bear the Nekroz Mirror, as well as the same layered red and white hair (the helmet of Brionac would cover the white bangs of Shurit). They all also have the same red-green heterochromia– the same as Shurit. This monster also has an enhanced form in Nekroz of Clausolas. This monster appears in the artwork of Nekroz Kaleidoscope. This is the only Nekroz monster to be Forbidden in TCG. The "If you Ritual Summon exactly 1 "Nekroz" Ritual Monster with a card effect that requires use of monsters, this card can be used as the entire requirement." effect can be applied even if this card is Tributed by a Ritual Spell Card while it is face-down on your side of the field or in your hand. The "If you Ritual Summon exactly 1 "Nekroz" Ritual Monster with a card effect that requires use of monsters, this card can be used as the entire requirement." effect can be applied even if this card is banished from the Graveyard using "Nekroz Mirror". While the effect of "Macro Cosmos" is being applied, if "Shurit, Strategist of the Nekroz" is Tributed by a card effect, and it is banished, the "If this card is Tributed by a card effect: You can add 1 Warrior-Type "Nekroz" Ritual Monster from your Deck to your hand." effect can be activated. : While the effect of "Macro Cosmos" is being applied, if "Shurit, Strategist of the Nekroz" is Tributed by a card effect, can you activate its effect? If you Ritual Summon exactly 1 "Nekroz" Ritual Monster using "Nekroz Kaleidoscope", then you can apply the effect of "Shurit, Strategist of the Nekroz" and use it as the entire Tribute. (You can Ritual Summon 1 "Nekroz" Ritual Monster of any Level.) However, if you Ritual Summon 2 or more "Nekroz" Ritual Monsters, you cannot apply the effect "Shurit, Strategist of the Nekroz", and you can only Tribute it using its usual Level (Level 3). : If "Shurit, Strategist of the Nekroz" is Tributed using "Nekroz Kaleidoscope", can you Ritual Summon a Ritual Monster of any Level? 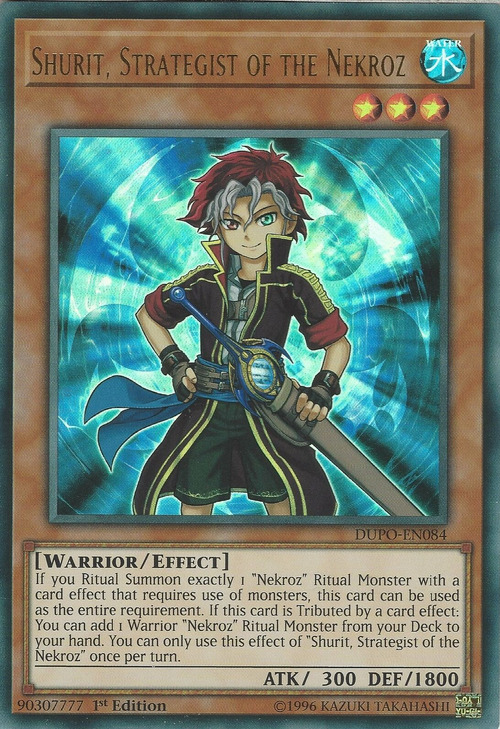 Even if the "If you Ritual Summon exactly 1 "Nekroz" Ritual Monster with a card effect that requires use of monsters, this card can be used as the entire requirement." effect is applied, the Level of "Shurit, Strategist of the Nekroz" does not change. (Therefore, it is not affected by the "Must be Ritual Summoned by using monsters other than Level 9 monsters, and cannot be Special Summoned by other ways." of "Nekroz of Trishula". 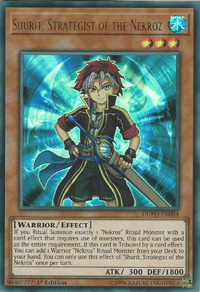 ): Can the effect of "Shurit, Strategist of the Nekroz" used to Ritual Summon "Nekroz of Trishula"?